These two entities are being talked about in education circles; thankfully more and more people are recognizing the value of a child’s connection with nature for her whole development. Nature’s rhythms are comforting and grounding to the human nervous system. A child in nature can breathe deeply, her heartbeat can attune to the surroundings. There is a general invitation to explore, wander, and watch. Nature invites stillness and the attitude of reverence can be developed. Her orientation to herself and others, as well as within the environment is refined. It is important to ask, how can children have access to nature, its sounds, and textures? Can all of the child’s senses be employed to experience the natural environments of life: to feel sun, wind, rain, and snow? Gardening is being done in many schools, children are being given the chance to plant seeds, dig in the earth, find worms, harvest food, and prepare it for sharing with others. What experiences can your child have at home that offer time in nature? 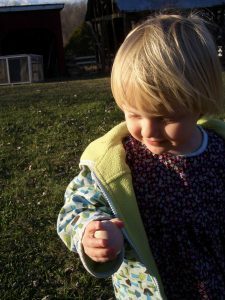 In this photo, a young child, just over three years old holds in her hand one of the first eggs laid by chickens on the farm. As an observer, notice the wind gently moving her hair while the sun warms her face and body. Her small hand holds the egg with care and intention. She is absolutely aware that she is holding a precious egg. Adults oftentimes miss opportunities for children like this because we swoop in, we have the attitude that the object will break, that the child cannot control her grip. Instead consider how prime this moment is for teaching by modeling and sharing. If the child has seen you take care and hold fragile objects gingerly then she will have a reservoir of impressions, she will know how to respond when something breakable is offered. Now look at her face. See how she sees the egg and imagine how she might be feeling when holding something so delicate. She found the egg, which only adds to how significant the experience is for this child. To be asked to take responsibility and genuinely participate in an activity that is part of your family’s life is an honor, it is a way of being seen and validated. Her contribution was not only to look for the eggs, but when she found one or more, to gather them up and bring them inside to the kitchen where then, this food produced and gathered just outside her back door, becomes part of the family’s nourishment. Imbedded in this image are many principles at work beyond a child’s access to nature. You might ask, what values are important in your family? In what ways are these values expressed in your family? If someone visited your home and family would that person be able to recognize these values? Which ones are dominant, which values might be brought forward to shine? Family Life Enrichment is about your vision for your family and asking yourself questions about how your ideals can become clearly manifested. 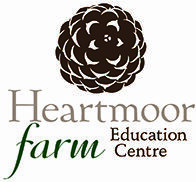 Thank you for joining me here at Heartmoor Farm Education Centre Family Life Enrichment Blog. Please visit again, and feel free to contact Elizabeth if you would like more information about creating a vibrant, nurturing home environment for children.